To me, being innovative doesn’t just mean making things different, but making things better! Given this, I think our first Innovation Week at Georges Vanier Elementary would meet the criteria for being innovative. Our Innovation Week took place from December 9 – 13, 2013, and was inspired first by witnessing Genius Hour in many classrooms in our school, then by hearing about Jesse McLean‘s experience with his own Innovation Week at Greystone Centennial Middle School in Parkland School Division in Spruce Grove, Alberta. What prompted us further was hearing about Innovation Week over at Fraser Heights Secondary in Surrey. Discussions started with staff members who embraced the idea, then we began to advertise to students. I have to say that as much as we tried to explain what Innovation Week was (though not really being too sure ourselves), I’m not certain students actually understood what they were signing up for or what they were missing. Some took their application, filled it out as best as they could, while others opted out and decided to wait and see what Innovation Week would look like. We had a total of 75 students from Grade 3-7 participate. I was neither surprised or disappointed by that number as I didn’t really know how the event would evolve. What I do know is that since there were not enough students participating to collapse other classes to thereby free up teachers, I was alone with the group much of the time. Special thanks for our EA staff who came in to assist and to the many teachers who stopped in to look and ask questions, all on their free time. I even had a teacher who retired last year, Liane Jagger, come and assist for three days. What a great help! A new and improved chair. A rolling storage container with built-in iPod charger. Were engaged in personally relevant learning. Adjusted their initial plans based on the challenges they were having. Confirmed that they made good choices regarding learning partners or realized that the choices they made regarding partners did not help them in their learning. Reflected on the competencies they were developing and demonstrating. Were inspired daily by videos about creativity and innovation. One favourite was Steven Johnson’s Where Good Ideas Come From below. Were on-task and continued to work without direct adult supervision. Developed ideas for future Innovation Week Events. Were extremely proud on of their learning on presentation day, sharing their projects with peers, teachers, and parents. As an aside, other innovative ideas that were popping up around the school while Innovation Week took place in the gym. In Ashley Henderson and Matt White’s classes, students participated in Learn a New Skill week and, like the students participating in Innovation Week, were initially taken aback when given the opportunity to make their own decisions about their learning, but later embraced the freedom of the experience. Skills students decided to focus on included: juggling, learning card, magic and coin tricks, stop motion animation, duct tape purses, and optical illusions. While in Francoise Rempel and Hugh McDonald‘s classes, students spent time everyday working to create Rube-Goldberg Machines. I had the chance to visit on the last day and were students ever challenged and engaged! 2013 ended in a very positive way at our school and I look forward to working with our wonderful staff and community to further explore ways to innovate in order to further engage our learners and bring genuine enthusiasm to the work they do. What innovative ideas are swirling around in your head? Are you ready to share them and put them into action? 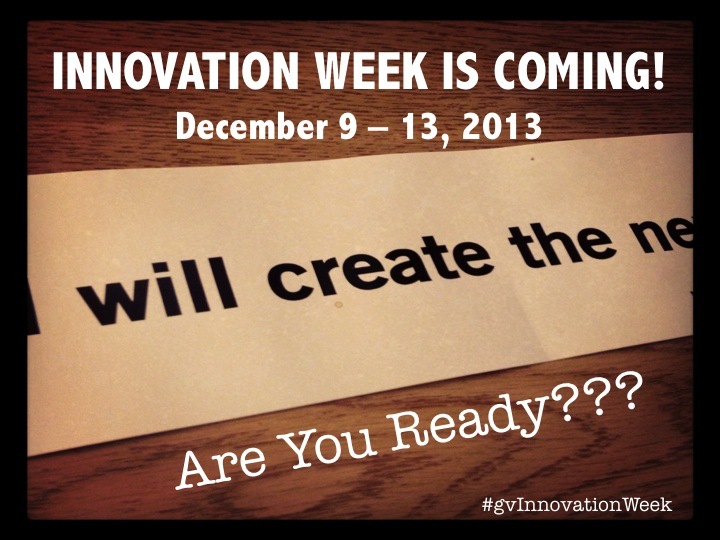 What a great start you have had to Innovation Week! I hope that all the excitement will continue to build and that your Innovation Week next year will be even bigger and stronger. 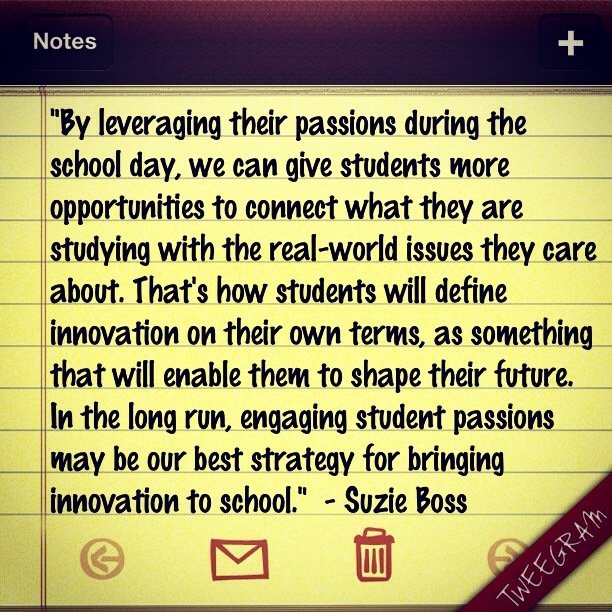 It sounds like your students have embarked on a new way of self directed learning. It takes a lot of courage for your students, staff, and for you to head off in this new direction. It also sounds like your school community was pretty curious to see what the students would come up with. This is very exciting. Good for you. I was so impressed with how your school community embraced your own Innovation Week. We consistently receive validation of the idea that kids learn best when given license to follow their passions and have ownership over their learning. I was so happy (though completely spent) following our Innovation Week, especially when I saw how engaged students were. Thanks for the leadership and inspiration you have provided me in my journey!